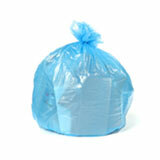 Our 3-6 Gallon Bag collection offers many bags that usually work well in the cans below. 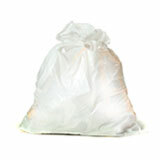 Choosing small waste basket liners for all your little garbage cans is a matter of choosing the right tool for the job. 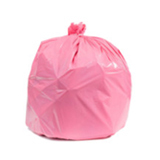 Using these 3 to 6 gallon trash bags is both more attractive and more effective than swamping the can in an oversized garbage bag or reusing wrinkled, oddly-colored shopping bags which are prone to holes and leaks. 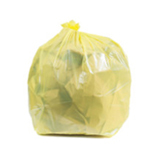 The smallest bags we sell are made from high-density plastic, which makes them extra lightweight and economical, especially when you buy in bulk! 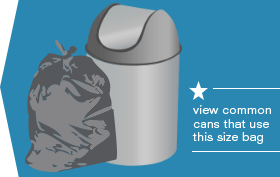 They only have to handle very small loads of trash so they don’t need to be especially thick. 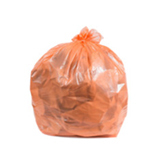 At six microns, these small trash bags feel a lot like the produce bags you’d find in a grocery store, but they are stronger and more resilient. 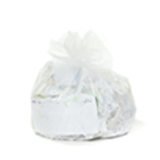 They are excellent for paper office waste and tissues, and all of these bags have a virtually leak-proof star seal, so wet garbage isn’t a problem. 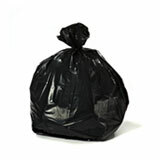 You can buy little can liners in large quantities with our excellent selection of 3 to 6 gallon wholesale garbage bags. 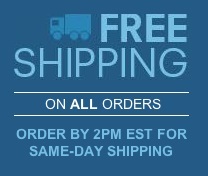 Buying bulk small trash can liners is more convenient and more affordable than constantly running to the local store for refills, and it’s incredibly easy when you order online from Plastic Place. 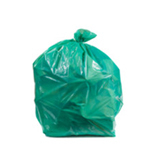 We offer quantities from 100 to 2000, so you’ll never have to run out of the small garbage bags you need around the home or office. 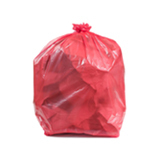 Because your satisfaction is 100% guaranteed, you can have total confidence that these small trash bags will live up to your expectations.